1. 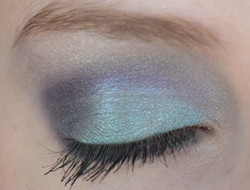 Prime the eyelid using Urban Decay's Eyeshadow Primer Potion. 2. Apply a light emerald green (such as 'Flipside') all over the main part of the lid. 3. 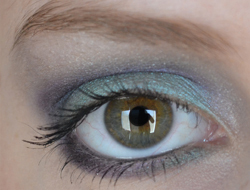 Add a darker green over the top of the outer half. 4. 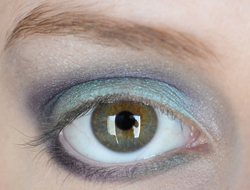 Use a dark purple eye shadow to fill in the crease, and define the shape of the outer V.
5. 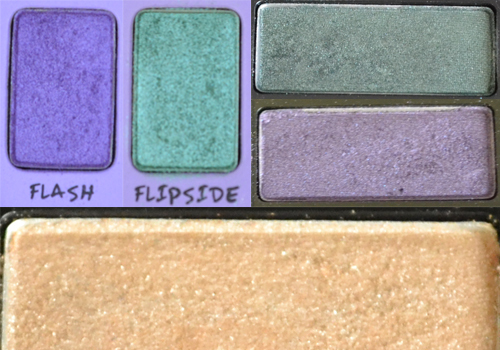 Go over this same section with a more vibrant purple, such as 'Flash'. 6. 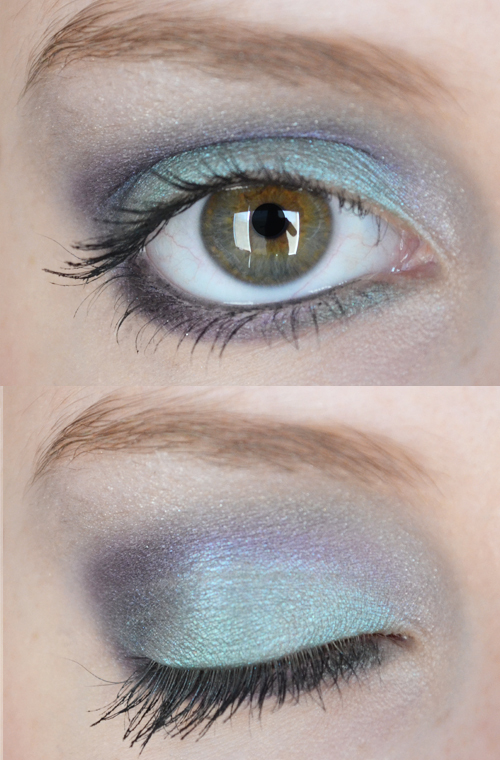 This step is optional, and depends on whether you would prefer a bright or smoky eye. 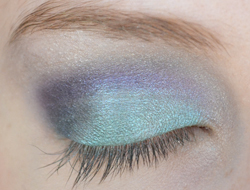 You can add a sweep of black eyeshadow over the crease if you'd like smoky (sorry I forgot to take a photo of the eyeshadow, but I used 'Oilslick' by Urban Decay! ), or just leave it as it is for a bright eye. 7. 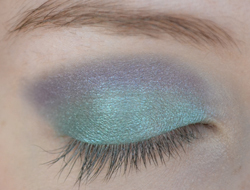 Next take a shimmery shadow that matches your skin colour, and sweep it along under the brow and down into the inner corner. 8. 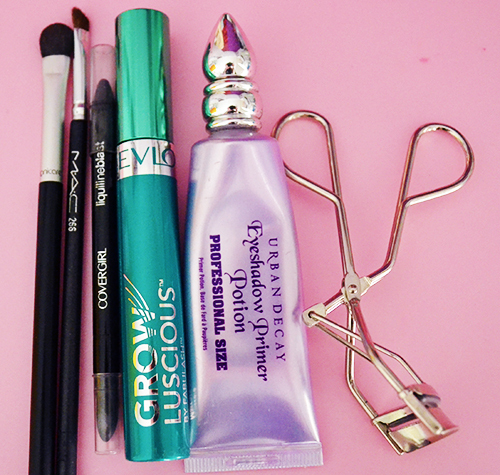 Take a small angled brush and apply the dark purple along the outer half of the under eye. 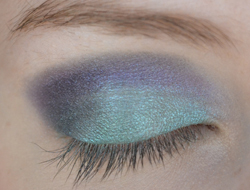 Once again, if you would like a smoky look you can add a bit of 'Oilslick' over the top. 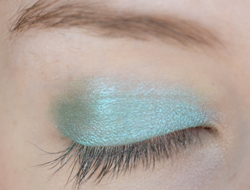 Then use the darker green on the inner half of the under eye. 9. As always complete the look by combing and curling your lashes, and then adding eyeliner along the waterline and mascara. This is pretty! I have worn emerald before but just by itself or with blues. Nice spin on it! This is legit AMAZING. 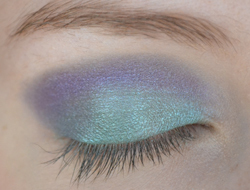 I want to try this--it looks so beautiful! I adore this outfit!!! Amazing style!